All my yentas if you feel me, throw your structured pink coats on! I'm not entirely sure what prompted me to deem this light pink number a "yenta coat", but the extrapolation seems appropriate given my contact with fabulous Yiddish women. When I was in Las Vegas with my girlfriend Zoe a few weeks back, we decided to make a quick stop at Topshop before heading to the airport. In true yenta (more like "grasshopper yenta") fashion, we made friends with all the stylists there and got to try things on in the big fancy personal styling dressing rooms. I rarely set out on a shopping excursion with an item in mind, but I had been lusting for a new vibrant structured coat. 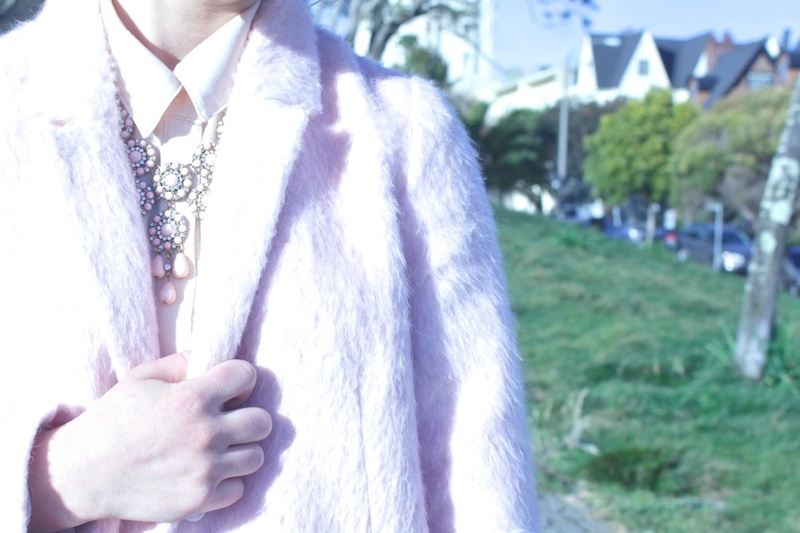 Of course Zoe found not one, but TWO cute colored coats before my fingers even grazed this light pink number. I must admit, was a little jealous, and this upped the ante for me to find my own! Like anyone looking for something very specific, I almost missed this piece hiding in a corner behind something too tacky for me to even remember what it was (the mind does block out traumatic experiences). I knew it was perfect, but Zoe's coat pick was also pink albeit more coral vs blush. The question was do we both need structured pink coats? DUH. In even more hilarious yenta fashion, we wore them out of the store, and onto the plane. We literally at this point had the exact same outfit: button-down shirts, black harem pants, black flats, and our fave new pink coats. Our boyfriends, who picked us up at the airport, said they weren't sure if the two girls waiting at the gate in pink coats were us, but they knew--they just couldn't handle it. I know the 90s are in, but ditch the friendship bracelets, and opt for a pink yenta coat. Then gossip about it. I'm pretty positive this experience is more bonding than friendship bracelets. Coat: Topshop, Blouse: Nordstrom, Jeans: James Jeans, Shoes: Superga x Man Repeller, Bag: Marc by Marc Jacobs, Necklace: Forever21, Sunglasses: Tom Ford "Carrie"